If practiced well, General intelligence and Reasoning can become one of the highest scoring sections of SSC CHSL Tier-I Exam. For your practice, we have designed mock papers which will test your ability to think and solve problems. The questions asked in this section are mainly the brain teasers and sometimes can be quite tricky to answer. So, let’s start the practice with the 1st General Intelligence & Reasoning Mock Test. You must try to finish all the 25 questions within 20 minutes time duration. After attempting all the questions, you can assess your performance by checking answers alongwith their Answers given latter in this article. 5. 64 128 92 220 148 404 ? 7. If OUGHT is coded as ABCDE in a certain language. How can TOUGH be coded in the same language? 8. If BITER is coded as KLMNO in a certain language. How can TRIBE be coded in the same language? 9. Pointing to a man in the Photograph Kabir said, ‘His son’s mother is the only daughter in law of my mother’. Who is the person in photograph to Kabir? • J is the neighbour of K.
• H is just next to the left of L.
• I is in one of the two seats in the middle. • M is the only one sitting between I and L.
If N is not sitting at the extreme end, then who occupies the extreme right seat? 11. Rahul and Govind start a race, and together they run for 50m. Rahul turns right and runs 60m. While Govind turns left and runs 40m. Then Rahul turns left and runs 50m. While Govind turns right and runs 50m. How far are both now from the each other? 12. How many such letters are there in the word “ACCELERATION” each of which is as far away from the beginning of the word as it is from the beginning of the English Alphabet? 13. Study the following number sequence and answer the questions given below it. How many odd numbers are there in the sequence each of which is immediately followed by to an odd number? 14. If the first and last digits of each number are interchanged what would be the second largest number? 15. Which number in the sequence has the highest sum of its digits? 16. Arrange the words given below in a meaningful sequence. 17. Statement: Some leaders are as corrupts as Mahesh. b) Most of the leaders are corrupt. c) Mahesh is not corrupt. d) Leaders are not corrupt. 18. What replaces the question mark? 19. In a certain code, ABET is written as 3-5-11-41, how will CUBE be written in same code? 20. Among the five given figure, four figures follow the same Pattern and one figure is different from these four. 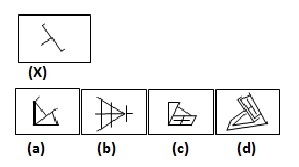 Mark this figure (which is different from the other four) as your answer. 21. In the following question, choose the correct mirror image from the alternatives (a), (b), (c) and (d), when mirror is placed on the line AB. 24. 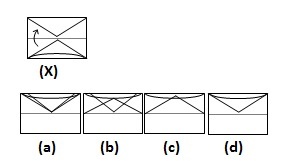 In the following example, find the one which resembles the pattern formed when the transparent sheet, carrying a design is folded along the dotted line along the direction shown by the arrow. 25. Choose the box that is similar to the box formed from the given sheet of paper (X). Explanation: Iron deprivation is Anaemia and the condition in which there is sleep deprivation is Insomnia. Explanation: In all the pairs except 25-54, the second number is the square of one-third of the first number. Explanation: Except d, the rest of combination of antonyms. Explanation: 64 128 92 220 148 404 ? Hence,? Will be replaced by 260. Hence, ? should be replaced by 244. Explanation: Here, the code for O = A, U = B, G = C, H = D and T = E. Then, the code for TOUGH is EABCD. Explanation: Here, the code for B = K, I = L, T = M, E = N and R = O. Then, the code for TRIBE is MOLKN. Explanation: The person is Kabir himself. Thus, Either J or K occupies extreme right seat. Explanation: Rahul and Govind will finish on a straight line and the distance between them will be = 40 + 60 = 100m. Explanation: Clearly, C is the third letter in the word “ACCELERATION” as well as in the English Alphabet. Therefore, there is only one such letter. Explanation: The statement clearly tells Mahesh is corrupt but nothing can be said about the leaders. 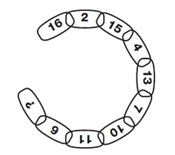 Explanation: Moving clockwise, around alternate segments in the chain, one sequence decreases by 1, 2, 3 and 4 each time, while the other increases by 2, 3, 4 and 5. Explanation: Coding pattern is (2n + 1) where n = position of alphabet in alphabetic order. Explanation: The figure X is embedded in option (d). Explanation: As figures (b) and (c) are similar to each other, then figure (a) and (d) must also be similar. We can obtain the answer figure for the missing portion by rotating the question figure by 180°. So, it is clear that answer figure (b) will replace (?) to make the question figure complete. Explanation: After folding the paper we will get option (d) as a answer. The difficulty level of the above mock test was ranging between easy to moderate level and a good score would lie between 20 to 23 marks. Don’t stop your practice until you achieve efficiency and accuracy. Try another mock test here – General Intelligence and Reasoning.